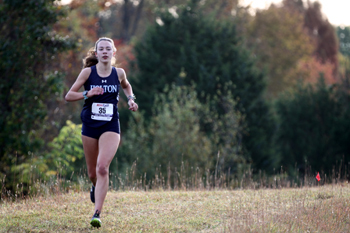 Kristen Bitsberger of Holton-Arms School became the first repeat individual champion, female or male, in the six year history of the Montgomery County Independent Schools Championship Meet. Bitsberger also led Holton- Arms to back-to-back team titles, but not without some personal adversity. She ran comfortably in the lead for two-and-a-half miles of the 5k race at Covenant Life School, and then she fell on one of the hills in a wooded section. "She actually passed me when I was on the ground, and then I had to catch her," said Bitsberger, referring to her nearest opponent, Joy Reeves of St. Andrew's Episcopal School. Up until that point, it looked like the defending champ would win the race easily by leading from start to finish. Instead, she needed to work back up to Reeves who had gained a three to five second lead, in Bitsberger's estimation. The Holton senior did not regain the lead until the final uphill with about a quarter mile remaining. When she came back into view of spectators, nobody knew that anything had gone awry. "It was rough," said Bitsberger. "It was upsetting because she got in front of me, and it was...kind of hard when you are exhausted and all of a sudden you have to push yourself to catch back up. But my first couple miles weren't that fast overall so I had enough in me to catch her." Her winning time of 20:44.9 was just three seconds slower than her winning time last year despite the fall. Reeves finished nine seconds back in 20:53.4. When asked what it meant to win back-to-back individual titles, Bitsberger was all about the team. "It's nice, especially because it's good for Holton to be able to be repeat champions. It's exciting for our program," she said. 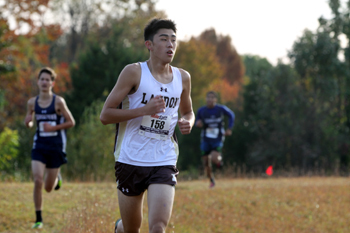 Kevin Tsai of Landon School won the boys race in 17:20.4 and led Landon to its fourth team county title in six years and first team title for Landon since 2014. Tsai was looking for a bounce-back race after what he said was not a good race for him personally at the IAC Championship a week ago. On winning the county title, Tsai said, "It's pretty much a confidence builder. Last week I didn't run so well so I used this to get my confidence back." Initially, the race appeared to be dominated by Georgetown Prep's Patrick Howley who got out hard from the gun, just as he had done a week earlier at the IAC Championship. Even as runners completed the first loop, Howley appeared comfortably in control. Tsai made his move in the seclusion of a wooded section, using the course's largest downhill to spur his comeback attempt. Tsai did not necessarily know at that point that he could catch Howley. "I saved up a lot of energy [in the first half], and I just tried to go for it after the first guy because he was way out there...where you enter the woods, going up the hill and then down I just started using that hill. I didn't catch him until about where the fence started [approximately 2.5 miles in the race]." Howley finished third behind Tsai and Jace Menendez of Landon. Landon put a third runner in the top four with Arihant Chadda ten seconds behind Howley. Landon needed the low numbers because Georgetown Prep put six in front of Landon's #5. Landon edged out Prep, 34 to 39.